It comprises the Chief Justice of India and 30 other judges. It has original, appellate and advisory jurisdictions. The Supreme Court has extensive original jurisdiction for the protection of fundamental rights of citizens. It also acts as the court to settle disputes between various governments in the country. As an advisory court, it hears matters which may specifically be referred to it under the Constitution by the President of India. It also may take cognisance of matters on its own (or 'suo moto'), without anyone drawing its attention. It was first set up in Calcutta for administration of justice. The law declared by the Supreme Court becomes binding on all courts within India. In 1861 the Indian High Courts Act 1861 was enacted to create High Courts for various provinces and abolished Supreme Courts at Calcutta, Madras and Bombay and also the Sadar Adalats in Presidency towns which had acted as the highest court in their respective regions. These new High Courts had the distinction of being the highest Courts for all cases till the creation of Federal Court of India under the Government of India Act 1935. The Federal Court had jurisdiction to solve disputes between provinces and federal states and hear appeal against judgements of the High Courts. The Supreme Court of India came into being on 28 January 1950. It replaced both the Federal Court of India and the Judicial Committee of the Privy Council which were then at the apex of the Indian court system. Supreme Court initially had its seat at Chamber of Princes in the Parliament building where the previous Federal Court of India sat from 1937 to 1950. The first Chief Justice of India was Sir H J Kania. In 1958, the Supreme Court moved to its present premises. Originally, Constitution of India envisaged a Supreme Court with a Chief Justice and seven Judges; leaving it to Parliament to increase this number. In formative years, the Supreme Court met from 10 to 12 in the morning and then 2 to 4 in the afternoon for 28 days in a year. The building is shaped to symbolise scales of justice with its centre-beam being the Central Wing of the building comprising the Chief Justice’s court, the largest of the courtrooms, with two court halls on either side. The Right Wing of the structure has the bar - room, the offices of the Attorney General of India and other law officers and the library of the court. The Left Wing has the offices of the court. In all there are 15 court rooms in the various wings of the building. The foundation stone of the supreme court's building was laid on 29 October 1954 by Rajendra Prasad, the first President of India. The main block of the building has been built on a triangular plot of 17 acres and has been designed in an Indo-British style by the chief architect Ganesh Bhikaji Deolalikar, the first Indian to head the Central Public Works Department. The Court moved into the building in 1958. In 1979, two new wings - the East Wing and the West Wing - were added to the complex. 1994 saw the last extension. The design of the Court's seal is reproduced from the wheel that appears on the abacus of the Sarnath Lion capital of Asoka with 24 spokes. The inscription in Sanskrit "yatodharmastato jayah"(यतो धर्मस्ततो जयः) means "whence law (dharma), thence victory". It is also referred to - as the wheel of righteousness, encompassing truth, goodness and equity. Supreme Court Rules, 2013 entitle only those advocates who are registered with the supreme court, called 'Advocates-on-Record' to appear, act and plead for a party in the court. Those advocates who are designated as 'Senior Advocates' by the Supreme Court or any of the High Courts can appear for clients along with an Advocate-on-Record. Any other advocate can appear for a party along with or under instructions from an Advocate-on-Record. As originally enacted, the Constitution of India provided for a Supreme Court with a Chief Justice and 7 judges. In the early years, a full bench of the Supreme Court sat together to hear the cases presented before them. As the work of the Court increased and cases began to accumulate, Parliament increased the number of judges from the original 8 in 1950 to 10 in 1956, 13 in 1960, 17 in 1977, 26 in 1986 and 31 in 2008 (current strength). As the number of the judges has increased, they sit in smaller benches of two or three (referred to as a division bench) — coming together in larger benches of five or more (referred to as a constitution bench) when required to settle fundamental questions of law. A bench may refer a case before it to a larger bench, should the need arise. In practice, judges of the supreme court have been selected so far, mostly from amongst judges of the high courts. Barely six - Justices S. M. Sikri, S. Chandra Roy, Kuldip Singh, Santosh Hegde, R. F. Nariman, U. U. Lalit and L. Nageshwara Rao have been appointed to the supreme court directly from the bar (i.e. who were practising advocates). The supreme court saw its first woman judge when Justice M. Fathima Beevi was sworn into office in 1989. The sixth and the most recent woman judge in the court is Justice R. Banumathi. In 2000 Justice K. G. Balakrishnan became the first judge from the dalit community. In 2007 he also became the first dalit Chief Justice of India. In 2010, Justice S. H. Kapadia coming from a Parsi minority community became the Chief Justice of India. The Constitution seeks to ensure the independence of Supreme Court Judges in various ways. As per the Constitution, as held by the court in the Three Judges' Cases - (1982, 1993, 1998), a judge is appointed to the Supreme Court by the President of India on the recommendation of the collegium — a closed group of the Chief Justice of India, the four most senior judges of the court and the senior-most judge hailing from the high court of a prospective appointee. This has resulted in a Memorandum of Procedure being followed, for the appointments. Judges used to be appointed by him on the advice of the Union Cabinet. After 1993 (the Second Judges' Case), no minister, or even the executive collectively, can suggest any names to the President, who ultimately decides on appointing them from a list of names recommended only by the collegium of the judiciary. Simultaneously, as held in that judgment, the executive was given the power to reject a recommended name. However, according to some, the executive has not been diligent in using this power to reject the names of bad candidates recommended by the judiciary. The collegium system has come under a fair amount of criticism. In 2015, the Parliament passed a law to replace the collegium with a National Judicial Appointments Commission (NJAC). This was struck down as unconstitutional by the Supreme Court, in the Fourth Judges' Case, as the new system would undermine the independence of the judiciary. Putting the old system of the collegium back, the court invited suggestions, even from the general public, on how to improve the collegium system, broadly along the lines of - setting up an eligibility criteria for appointments, a permanent secretariat to help the collegium sift through material on potential candidates, infusing more transparency into the selection process, grievance redressal and any other suggestion not in these four categories, like transfer of judges. This resulted in the court asking the government and the collegium to finalize the Memorandum of Procedure incorporating the above. The position of Chief Justice of India is attained on the basis of seniority amongst the judges serving on the court. Supreme Court judges retire at the age of 65. However, there have been suggestions, including from the judges of the Supreme Court of India, to provide for a fixed term for the judges there including the Chief Justice of India. Article 125 of the Indian Constitution leaves it to the Indian Parliament to determine the salary, other allowances, leave of absence, pension, etc. of the Supreme Court judges. However, the Parliament cannot alter any of these privileges and rights to the judge's disadvantage after his appointment. A judge gets ₹90,000 per month, the Chief Justice earns an additional ₹10,000. A judge of the Supreme Court can be removed under the Constitution only on grounds of proven misconduct or incapacity and by an order of the President of India, after a notice signed by at least 100 members of the Lok Sabha (House of the People) or 50 members of the Rajya Sabha (Council of the States) is passed by a two-third majority in each House of the Parliament. A person who has retired as a Judge of the Supreme Court is debarred from practising in any court of law or before any other authority in India. Article 137 of the Constitution of India lays down provision for power of the Supreme Court to review its own judgments. As per this Article, subject to the provisions of any law made by Parliament or any rules made under Article 145, the Supreme Court shall have power to review any judgment pronounced or order made by it. Under Articles 129 and 142 of the Constitution the Supreme Court has been vested with power to punish anyone for contempt of any court in India including itself. The Supreme Court performed an unprecedented action when it directed a sitting Minister of the state of Maharashtra, Swaroop Singh Naik, to be jailed for 1-month on a charge of contempt of court on 12 May 2006. This was the first time that a serving Minister was ever jailed. The Constitution of India under Article 145 empowers the Supreme Court to frame its own rules for regulating the practice and procedure of the Court as and when required (with the approval of the President of India). Accordingly, "Supreme Court Rules, 1950" were framed. The 1950 Rules were replaced by the Supreme Court Rules, 1966. In 2014, Supreme Court notified the Supreme Court Rules, 2013 replacing the 1966 Rules effective from 19 August 2014. Supreme Court Reports is the official journal of Reportable Supreme Court Decisions. It is published under the authority of the Supreme Court of India by the Controller of Publications, Government of India, Delhi. In addition, there are many other reputed private journals that report Supreme Court decisions. Some of these other important journals are: SCR (The Supreme Court Reports), SCC(Supreme Court Cases), AIR (All India Reporter), SCALE, etc. After some of the courts overturned state laws for redistributing land from zamindar (landlord) estates on the ground that the laws violated the zamindars' fundamental rights, the Parliament passed the 1st amendment to the Constitution in 1951, followed by the 4th amendment in 1955, to uphold its authority to redistribute land. The Supreme Court countered these amendments in 1967 when it ruled in Golaknath v. State of Punjab that the Parliament did not have the power to abrogate fundamental rights, including the provisions on private property. The 25th amendment to the Constitution in 1971 curtailed the right of a citizen to property as a fundamental right and gave authority to the government to infringe private property, which led to a furore amongst the zamindars. During the emergency period, the government also passed the 39th amendment, which sought to limit judicial review for the election of the Prime Minister; only a body constituted by Parliament could review this election. Subsequently, the parliament, with most opposition members in jail during the emergency, passed the 42nd Amendment which prevented any court from reviewing any amendment to the constitution with the exception of procedural issues concerning ratification. A few years after the emergency, however, the Supreme court rejected the absoluteness of the 42nd amendment and reaffirmed its power of judicial review in the Minerva Mills case (1980). After Indira Gandhi lost elections in 1977, the new government of Morarji Desai, and especially law minister Shanti Bhushan (who had earlier argued for the detenues in the Habeas Corpus case), introduced a number of amendments making it more difficult to declare and sustain an emergency, and reinstated much of the power to the Supreme Court. It is said that the Basic Structure doctrine, created in Kesavananda Bharati v. State of Kerala, was strengthened in Indira Gandhi's case and set in stone in [Minerva Mills v. Union of India]. Among the important pronouncements of the Supreme Court post 2000 is the Coelho case [I.R. Coelho v. State of Tamil Nadu (Judgment of 11 January 2007)]. A unanimous Bench of 9 judges reaffirmed the basic structure doctrine. It held that a constitutional amendment which entails violation of any fundamental rights which the Court regards as forming part of the basic structure of the Constitution, then the same can be struck down depending upon its impact and consequences. The judgment clearly imposes further limitations on the constituent power of Parliament with respect to the principles underlying certain fundamental rights. The judgment in Coelho has in effect restored the decision in Golak Nath regarding non-amendability of the Constitution on account of infraction of fundamental rights, contrary to the judgment in the Kesavananda Bharati case. The Supreme Court declared allotment of spectrum as "unconstitutional and arbitrary" and quashed all the 122 licenses issued in 2008 during tenure of A. Raja (then minister for communications & IT), the main official accused in the 2G scam case. The Supreme Court refused to stay the Andhra Pradesh High Court judgement quashing 4.5% sub-quota for minorities under OBC reservation quota of 27%. Three judge bench presided by Honorable Chief Justice Altamas Kabir issued notice to the Centre and the Election Commission of India (EC) on the PIL filed by a group of NRIs for online/postal ballot for the Indian citizens living abroad. In B.Prabhakara Rao vs. State of A.P. involved sudden reduction in age of superannuation from 58 years to 55 years of over 35,000 public servants of State Government, public sector undertakings, statutory bodies, educational institutions and Tirupathi-Tirumalai Devasthanams (TTD). They lost first round of litigation in the Supreme Court. Realising the mistake, fresh legislation was brought restoring the original age of superannuation of 58 years but providing that the benefit of new legislation would not extend to those whose reduction of age of superannuation had been upheld. In challenge to this law, Subodh Markandeya argued that all that was required was to strike down naughty “not” – which found favour with the Supreme Court bringing relief to over 35,000 public servants. 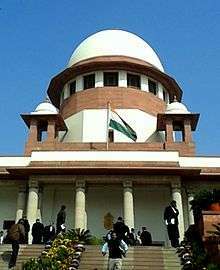 2008 saw the Supreme Court embroiled in several controversies, from serious allegations of corruption at the highest level of the judiciary, expensive private holidays at the tax payers expense, refusal to divulge details of judges' assets to the public, secrecy in the appointments of judges', to refusal to make information public under the Right to Information Act. The Chief Justice K. G. Balakrishnan invited a lot of criticism for his comments on his post not being that of a public servant, but that of a constitutional authority. He later went back on this stand. The judiciary has come in for serious criticisms from former Presidents of India Pratibha Patil and A. P. J. Abdul Kalam for failure in handling its duties. Former Prime Minister Manmohan Singh, has stated that corruption is one of the major challenges facing the judiciary, and suggested that there is an urgent need to eradicate this menace. The Cabinet Secretary of the Indian government introduced the Judges Inquiry (Amendment) Bill 2008 in Parliament for setting up of a panel called the National Judicial Council, headed by the Chief Justice of India, that will probe into allegations of corruption and misconduct by High Court and Supreme Court judges. According to Supreme Court newsletter, there are 58,519 cases pending in the Supreme Court, out of which 37,385 are pending for more than a year, at the end of 2011. Excluding connected cases, there are still 33,892 pending cases. As per the latest pendency data made available by the Supreme Court, the total number of pending cases in the Supreme Court as on 1 April 2014 is 64,330, which includes 34,144 Admission matters (miscellaneous) and 30,186 Regular Hearing matters. Recently, in May, 2014, former Chief Justice of India, Justice R.M. Lodha, proposed to make Indian judiciary work throughout the year (instead of the present system of having long vacations, specially in the higher courts) in order to reduce pendency of cases in Indian courts; however, as per this proposal there is not going to be any increase in the number of working days or working hours of any of the judges and it only meant that different judges would be going on vacation during different periods of the year as per their choice; but, the Bar Council of India rejected this proposal mainly because it would have inconvenienced the advocates who would have to work throughout the year. ↑ "Supreme Court of India". Retrieved 2015-10-03. 1 2 3 4 5 "History of Supreme Court of India" (PDF). Supreme Court of India. Retrieved 30 August 2014. 1 2 "Facilities at Supreme Court of India" (PDF). Supreme Court of India. Retrieved 14 May 2014. ↑ "Constitution of Supreme Court". Supreme Court of India. Retrieved 31 March 2013. ↑ "Organisational Chart of the Registry of the Supreme Court of India" (PDF). Supreme Court of India. Retrieved 26 April 2014. ↑ Chowdhury, Rishad Ahmed. "Missing the Wood for the Trees: The Unseen Crisis in the Supreme Court" (PDF). NUJS Law Review (July–September). 2012 (3/4): 358. Retrieved 3 November 2015. ↑ "Supreme Court of India — History". Supreme Court of India. Retrieved 21 June 2012. 1 2 3 4 "Section 124, Constitution of India". VakilNo1. Archived from the original on 26 December 2010. Retrieved 27 October 2012. ↑ "Supreme Court of India — Former Judges". Supreme Court of India. Retrieved 30 November 2014. ↑ Lord Cooke of Thorndon (2000). B. N. Kirpal, ed. Supreme But Not Infallible (Sixth Impression 2010 ed.). New Delhi, India: Oxford University Press. pp. 97–106. ISBN 9780195672268. Retrieved 15 January 2013. ↑ Venkatesan, V. "Interview with Justice J.S. Verma, former Chief Justice of India (The Judiciary: 'Honesty Matters')". Frontline (Volume 25 - Issue 20 :: Sep. 27-Oct. 10, 2008). Retrieved 8 November 2015. ↑ Krishna Iyer, V. R. (7 August 2001). "Higher judicial appointments - II". The Hindu. Retrieved 8 November 2015. ↑ Thomas, K. T. (13 August 2014). "In defence of the collegium". The Indian Express. Retrieved 8 November 2015. ↑ Sengupta, Uttam (21 October 2015). "SC Exposes 'Tyranny Of The Elected'". Outlook. Retrieved 2016-09-04. ↑ WP(C) No. 13/2015. "Report filed by Ms. Pinky Anand ASG and Arvind P. Datar on Representation/Suggestions for Improving the Collegium" (PDF). Department of Justice, Ministry of Law and Justice, Govt. of India. Retrieved 6 November 2015. ↑ Writ Petition (Civil) No. 13 of 2015 (16 December 2015). "Supreme Court Advocates-on-Record Association & Anr. v/s Union of India" (PDF). Supreme Court of India. ↑ Transferred Case(C) No. 6 of 2009 (6 July 2009). "Mahesh Chandra Gupta v. Union of I ndia & Ors.". Supreme Court of India. 2009 (8) SCC 273: 18/59. Retrieved 7 November 2015. ↑ "Salaries of SC, HC judges to increase three-fold". Times of India. Retrieved 9 June 2014. ↑ Chowdhury, Rishad Ahmed. "Missing the Wood for the Trees: The Unseen Crisis in the Supreme Court" (PDF). NUJS Law Review (July–September). 2012 (3/4): 367. Retrieved 3 November 2015. ↑ Maha minister gets jail for contempt Archived 15 November 2006 at the Wayback Machine. ↑ "Supreme Court Reports". Supreme Court of India. Retrieved 30 March 2013. ↑ "Supreme Court Middle Income Group Legal Aid Society". Retrieved 1 December 2014. ↑ "Types Of Legal Services Provided". National Legal Services Authority. Retrieved 1 December 2014. ↑ "Supreme Court Legal Services Committee". Retrieved 1 December 2014. ↑ V R Krishna Iyer (27 June 2000). "Emergency — Darkest hour in India's judicial history". The Indian Express. Retrieved 16 September 2007. ↑ Shelton, Dinah; Kiss, Alexandre (2005). Judicial handbook on Environmental Law (PDF). United Nations Environment Programme. p. 8. ISBN 92-807-2555-6. Retrieved 1 December 2014. ↑ 2G scam: SC scraps 122 licences granted under Raja's tenure, trial court to decide on Chidambaram's role - Times Of India. Articles.timesofindia.indiatimes.com (2 February 2012). Retrieved on 2013-07-18. ↑ "WRIT PETITION (CIVIL) NO(s). 80 OF 2013, NAGENDER CHINDAM & ORS. vs. UNION OF INDIA & ANR.". Supreme Court of India. 21 February 2013. Retrieved 2014-06-09. ↑ McCoy, Terrence (15 April 2014). "India now recognizes transgender citizens as 'third gender'". Washington Post. Retrieved 15 April 2014. ↑ Ex-chief justice under corruption panel scanner, Hindustan Times, New Delhi, 9 June 2008 Archived 2 August 2009 at the Wayback Machine. ↑ Bill for probe panel against errant judges cleared, iGovernment, 10 October 2008 Archived 21 July 2011 at the Wayback Machine. ↑ "Supreme Court Quarterly Newsletter — Oct — Dec 2011" (PDF). Supreme Court of India. Retrieved 18 September 2012. ↑ "Number of pending matters in Supreme Court as on 1st April 2014" (PDF). Retrieved 18 April 2014. ↑ "Proposal to make judiciary work throughout the year". Retrieved 9 June 2014.